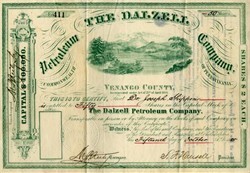 Beautiful engraved certificate from the Dalzell Petroleum Company of Pennsylvania issued in 1885. This historic document has an ornate border around it with a vignette of a mountain lake with an oil derreck. This item has the signatures of the Company’s President and Secretary.